Come work on Python projects, get programming help, help others, and hang out. Bring your own project or work on one of the suggested projects below. 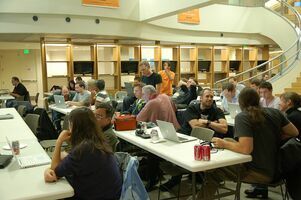 Staff from the Boston Python Workshop will be here to help beginning Python programmers with language basics and practice. 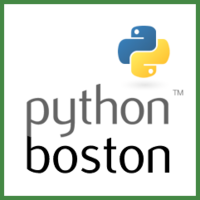 Signup: you must register for this event on the Boston Python Meetup. Food: Pizza will be provided. Wireless: the SSID is: CAMBRIDGE. Try to browse the web and you'll be redirected to a page to click through terms of service. The official Python tutorial: http://docs.python.org/tutorial/. This tutorial is very comprehensive, but it sometimes throws in unnecessarily advanced concepts. This is a solid tutorial for people with prior programming experience, and is still a good tutorial for new programmers if you are willing to skip over the advanced concepts and come back to them later. How to Think Like a Computer Scientist: Learning with Python: http://openbookproject.net/thinkcs/python/english2e/. This tutorial does a particularly good job of introducing programming concepts and terminology. Learn Python the Hard Way: http://learnpythonthehardway.org. Despite the name, some people find this to be a gentler introduction than the official Python tutorial. An introduction to Python through writing games: http://inventwithpython.com/chapters/. Practice Python online with bite-sized exercises: http://codingbat.com/python. We also have custom CodingBat questions from the Boston Python Workshop: http://openhatch.org/wiki/CodingBat. Practice writing code to solve a problem from scratch with the Scrabble challenge. Contribute to an open-source project that uses Python. Developers from OpenHatch, Twisted, and other projects will be here. If you contribute to an open source project that uses Python and want to help new contributors, let us know! Unleash your inner DJ with the Echo Nest and Echo Nest Remix APIs. Have more project suggestions? Add them to this wiki page! This page was last edited on 29 August 2012, at 14:48.